A tongue-in-cheek story about clarity, conciseness and context. Being in front of a blank page can be both exciting and daunting; often, this is followed by procrastination. One thing is certain though: there will be revisions. It is then best to get on with it and rush the first draft; it can always be improved later. Writing a scientific paper doesn’t require storytelling abilities. Conveying hard-won scientific facts should instead be done in a form that appeals to the expert; if it puts off the beginner, then so be it. In truth, there is no need to sugar-coat a great deal of facts with a story. How facts are linked to each other and interpreted as a whole is for the reader to work out. All reports start with a title — the first chance to impress. There are three easy ways to come up with a suitable heading: make it long, fill it with jargon and empty words, and overstate the claims or purpose. Here is an example: ‘On an overarching framework utilizing solely specialized standards that expedites unprecedented and unparalleled applicability opportunities’. The recipe is clear: vagueness, low information density and exaggeration of significance. You will get noted. There are of course more opportunities to win due attention. The next is the abstract. Again, it is easier to write a lofty synopsis: the passive voice should be overused; the importance of the work ought to be emphasized by using grandiose terms such as ‘paradigm shift’, ‘striking finding’ and ‘general platform’; as many details as possible ought to be included; and everything that is new must be noted as such (by using ‘new’, ‘novel’ and ‘for the first time’). Avoiding reader dullness should be a priority. For this, take a lesson from the demands of brain games: deciphering real meaning, connecting the dots, guessing causality and prompting dictionary use. For example, do not be shy about using multiple acronyms; they are easy to remember, in particular if you manage to work out how to add SMART, GR8 or FANNY into the text. Do not pay attention to punctuation; commas and semicolons, brackets, hyphens, and en dashes and em dashes are for poets and linguists; in scientific writing, the meaning of facts is independent of punctuation (true facts are real life things in fact). Add ambiguity — it keeps things precisely interesting. When exposing facts or ideas, whether they are ordered according to causal logic, temporal sequence or importance is irrelevant as long as they are freely connected with, for example, ‘therefore’, ‘due to’, ‘while’, ‘indeed’, ‘in order to’ and other meaningless transition words. Also, do not forget to spice up the text with pompous discourse by utilizing sublime locutions. Structure and flow can frustrate an infecting narrative. On the one hand, organized sections and headings and smooth discussion can give the impression that the work is trivial or was easy to carry out. On the other hand, understanding brilliant ideas and hard facts needs effort and skill on the part of the reader. Indeed, learning involves struggle, and what is easily understood is immediately forgotten. Crucially, context can get in the way of conveying new results. Hence, keep it at a minimum. The results should stand out on their own. Yet when fearing that fellow specialists may not appreciate the gist of the work, repeat the same main points in the abstract, at the end of the introduction, in the discussion, and again when concluding; excellent results never bore. Also, add numerous references to background work (especially your own), and do not forget that great papers cite great papers. Naturally, drafts are meant to be revised. Let the reviewers and editors help you. The former may belong to a group that always ask for more facts, and editors are prone to also nagging about the premium of space and the need for more discussion. In the event that reviewers or an editor complain, do not blame yourself. Such feedback may be opinion rather than factual, and should you suspect so, do not be afraid to disregard the requests. Ultimately, don’t spend too much time considering the potential readers of your work; you won’t be able to please everyone. 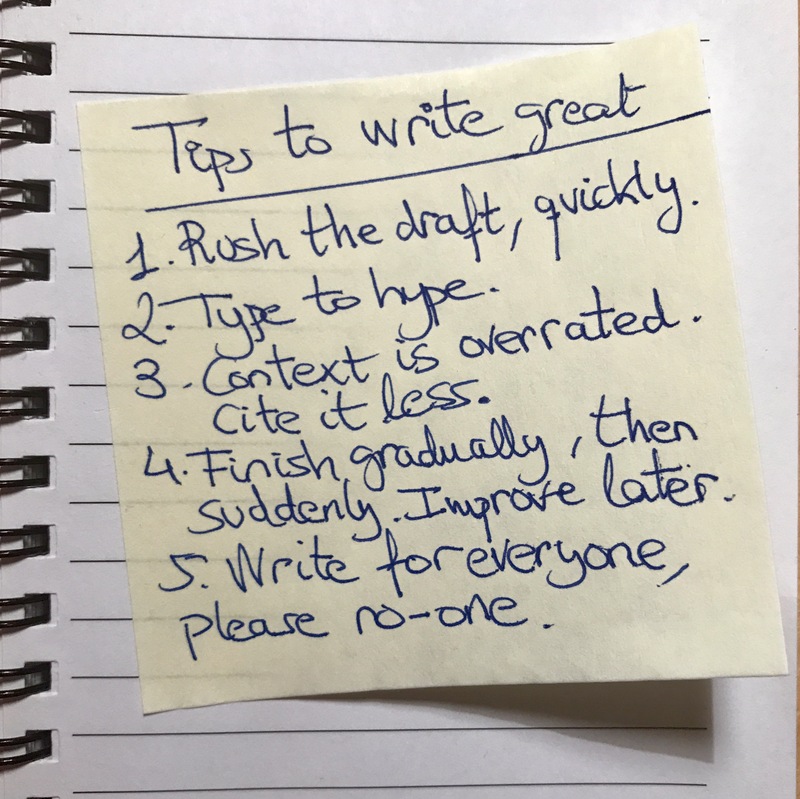 Not writing well is easy when you know the tricks. Please do not pass them on. Insightful! Often learn a lot from your writing!